I've done several MorningStar Farms reviews and while I've often found their products to be somewhat tasty, I've often given them negative reviews because of their cost. 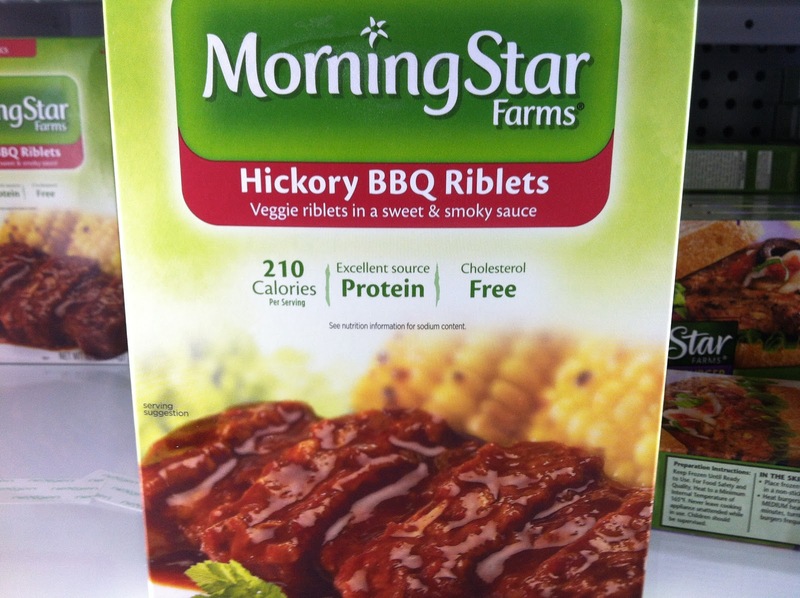 In this review of the MorningStar Farms Hickory BBQ Riblets, I'm going to focus only on the flavor of these and just disregard the cost. What may be expensive/inexpensive to me may be the opposite for you, the reader, so I'm just going forget about that. That said, I did pick these up at Marsh for $3.99 on sale and each box contains two riblets that come in at roughly five ounces per riblet with 210 calories and sixteen grams of protein each. 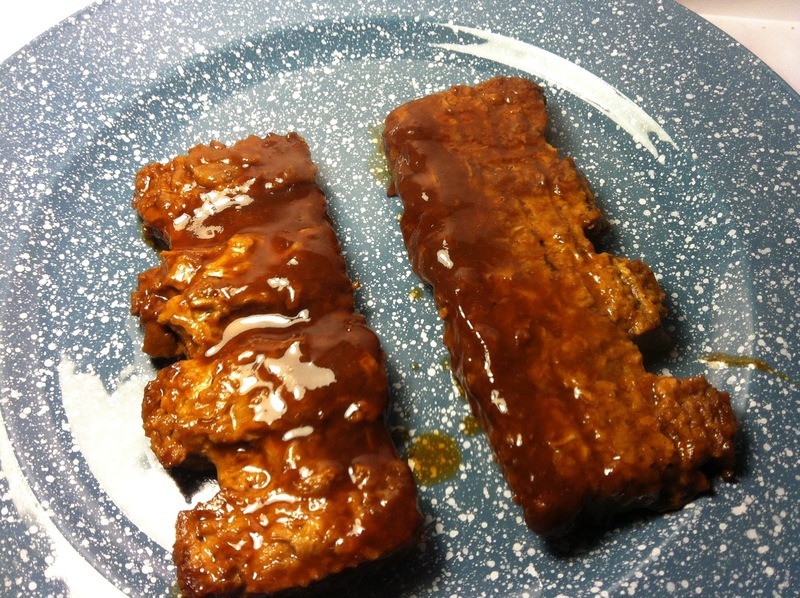 Above is the finished product of these riblets after cooking. MorningStar Farms recommends that you cook these using either the oven or the microwave. Obviously the oven takes substantially longer, but since I had some time to kill, I used the oven preparation and the above picture is the final product. Despite the fact that these are soybean based, MorningStar Farms at least went to the effort to make these look like barbecue ribs. The riblet on the left is the top side of the rib with the ridges of where the bones would be in a typical rib product and the riblet on the right is the bottom side of the rib. Outside of them doing a fair impersonation of a rib product drenched in a sweet and spicy smelling sauce, there's not a whole lot else to say about this. 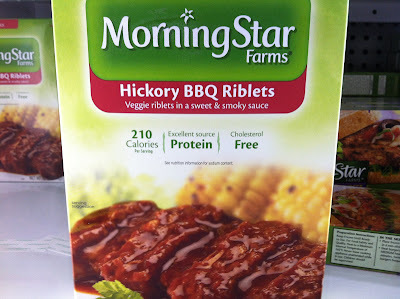 Although, one thing that did make me chuckle after taking a look at these was that they looked strikingly similar to a McDonald's McRib and being that those things get bashed for their contents all the time, I found it funny that MorningStar Farms' riblets somewhat resembled that product. In terms of mouthfeel, it was a lot like a McRib as well. It certainly wasn't meaty since it technically has no meat products whatsoever, but it did have that McRib-like chew. Of course, the chew in this was the byproduct of soybeans and therefor a bit grainy and gummy like a bean would be as you chew it, but it still wasn't bad. The taste was more bean-like (obviously) than pork, but just like a McRib, it was a reasonable enough approximation of the real thing. Add in the hickory barbecue sauce which had a sweet and smoky taste and honestly, this was about as close a faux product can come to emulating the real thing. Like I said, the sauce was sweet from the honey and also had a bit of smoky flavor with a slight peppery kick, but in general it was a mild and pleasing flavor. Buy It or Fly By It? This is perhaps my most shallow review ever in that I didn't have a whole lot to say about this other than it is a reasonable enough approximation of the real thing for a vegan product, so I feel as if I'm cheating everyone with this review. Still, the fact that the approximation was reasonable enough and flavorful enough means that this gets a BUY IT rating. If you are a vegan, vegetarian or just don't feel like eating a pork product, you can pick this one up and be rest assured that you are getting something flavorful and worthwhile and that is enough for me. The fact that it is pretty much just like a McRib, which I enjoy anyway, makes it even more appealing. This is my second favorite Morningstar Farms product. I wish Costco sold these in bulk. My favorite Morningstar Farms product? Morningstar Farms Meal Starters Grillers Recipe Crumbles. It's surprising how good of a product that these are, especially for something fake. Looking back, I'm still astounded by how much I liked them. As a muslim who doesn't eat non-kosher/non-halal meat, but loves it more than the next guy, these were an amazing find for me. My body responds to protien and morning star products are so jam packed with them, my taste buds don't care it isn't meat! Too bad MF products are so outrageously expensive. Got these on sale. I thought it strange that on the box it says go to the website to find out how to cook this in the oven. I went there and couldn't find any reference whatsoever to this. I really liked this but it is quite pricey and a bit too sweet for me. If I get this again on sale, I would scrape off the sauce and add my own. My favorite MS products are the crumbles and pizza burger, always have them in the freezer.